It’s rare that a book completely lives up to the hype, but this one really did. I went in with mixed expectations, having loved They Both Die at the End but had mixed feelings about More Happy Than Not. But this one is definitely up there, and even above my love for They Both Die at the End. It’s definitely been my favourite Silvera novel and I’m so excited for What if It’s Us! I found History is All You Left Me so raw and beautiful. It follows the story of Griffin, a boy who lost his first love and ex-boyfriend way too young. Griffin also suffers with OCD and I loved the way Silvera spoke about how he struggled through life with OCD. I found his disorder so believable and well written. I began by having doubts about Jackson, but honestly I think that just shows how great the writing is, because I liked him more just as Griffin did, as they got to know each other throughout the book. I will openly admit I cried at least a couple of times throughout this story, and I closed the final page with tears in my eyes. I also found the flashbacks really worked, and it definitely takes a talented author to write past and present like that! The plot also twisted and changed throughout, which isn’t too common in contemporary and it provided a reason to keep turning the pages. I really have to point out that I found this book perfect for reading in a couple of sittings. I usually have to have a break while I’m reading and I struggle to read in long sittings, but not with this book! I just felt it would be very hard to get bored of the story, especially with the plot. I read most of the book on a long train journey and I finished it in 5 days! I honestly can’t find anything wrong with this book, and it’s going to have to be 5 stars. It’s beautifully written, emotional, honest and raw. What’s not to like? I had similar feelings about More Happy Than Not. 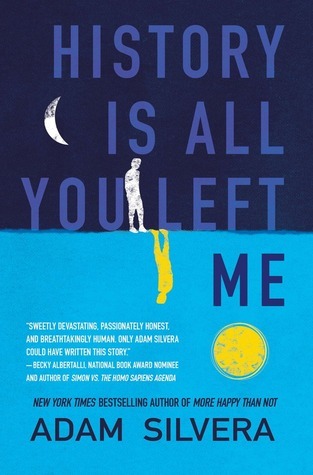 I have a feeling this one has the potential to be my favorite work from Adam Silvera, so hopefully I pick it up soon. Great review!